Here at Fernglade Farm we’re not shy about blatantly ripping off a current (or even a past) pop culture reference in order to get a snappy sounding blog title! 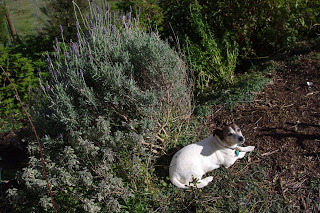 And this week’s blog title was almost handed to me on Sunday by Sir Scruffy – the scruffy terrier – who has won the most recent round of the ongoing Bone Wars saga which is being waged amongst the fluffy collective (that description refers to the rest of the dog pack). Sir Scruffy is a wise canine because after having enjoyed the large beef joint bone for a few quiet hours on a sunny winters afternoon, he came to the conclusion that it would be sensible if the other members of the fluffy collective were deprived of that same bone. Obviously he was only considering the interests of maintaining a harmonious pack. 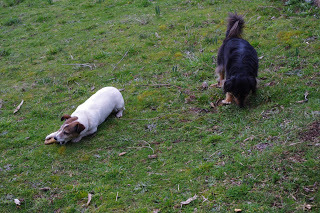 And clearly the best tool at Sir Scruffy’s disposal was burying the bone somewhere that the other dogs would not find it. And when it comes to such activities, Sir Scruffy is the best in the business, as he can hide bones for weeks on end where the other dogs will not be able to find them. Sir Scruffy is using his superior “Secret Fluffy Mind Powers” to achieve this bone disappearing act, although a more pragmatic person would suggest that he is just really good at burying bones where the other dogs are too stupid to find them. Whatever may be the case, Sir Scruffy has set hard limits on the other dogs activities in the ongoing Bone Wars, for his own reasons, which may be an altruistic choice, but in all honesty may also involve a certain degree of self-interest. In observing those bone actions, I started thinking about the issue of limits because when I was an impressionable teenager, adults used to tell me all the time that the sky was the limit, and I could achieve whatever I desired, so long as I put the effort into that objective. They usually then went on to say that the times were now so different for me than they had it and how lucky was I to be able to do whatever I wanted. That sounded pretty cool to me. I mean who doesn’t want lots of stuff or to be an astronaut? Unfortunately for those adults, I was mildly apathetic, whilst also still being a good student, but I never really had much in the way of great expectations or desires. And the idea of having no limits seemed mildly disconcerting and a bit disorienting to me. I mean who seriously wants to grow up to be an astronaut when that means being exposed to hard radiation and possible death in a high vacuum environment? This concept held absolutely no appeal to me, and here it is worthwhile mentioning that as a very young child my older sisters took me to watch the sci-fi horror film “Alien” at the theatre. Unfortunately for me, it wasn’t cool for them to hang with their younger brother so they ditched me, and there I sat alone and apart from my older sisters watching this horrific film about unpleasant encounters in deep space with clearly superior alien beings – who had a specific agenda – which didn’t involve humans. There was no way I wanted any part of that space business. No way! It seemed absolutely horrible stuff and those aliens appeared to me to make very unpleasant company. Anyway, despite the rhetoric from those adults, who were clearly trying to fool me with their talk of the sky being the limit (thankfully for me that same sky set a solid upper limit on the number of astronauts positions required! ), I didn’t notice that any of those same adults were reaching for the stars themselves. I didn’t see many adults aiming to become an astronaut so that they could take on really nasty and very harmful aliens. I mean, did you the reader see anyone doing that? Maybe it was the socio-economic strata I grew up in, but then again maybe not. All I know is that I certainly did not see any adults at all aiming to study and train hard enough so that they could achieve a career as an astronaut so that they could get quickly killed by a seriously bad assed alien? So one day, the obvious conclusion popped into my head whilst I was yet a young teenager: Adults were capable of lying to children.Who would have thought that this was possible? 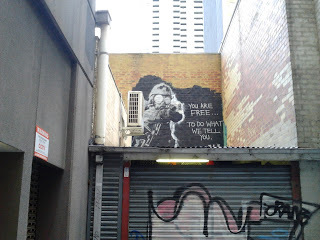 Last week as I walked through an obscure back lane in Melbourne, as I have done so for many years, I thought about that turning point in my life where I discovered the shocking realisation that adults lie to children about not only small things, but also the very big things. And that thought popped into my head because I passed by a choice bit of entertaining and yet confronting street art which always turns my mind towards considering such topics. But the unspoken question always remains: Why are limits considered to be bad? An experimental biscuit based lemon tart was baked this week. 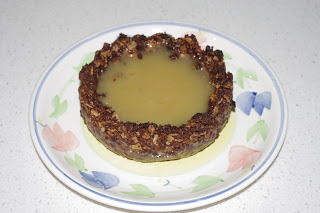 Oh, it was tasty but so full of sugar and butter! This week I continued the expansion of the solar photovoltaic off grid power systems. 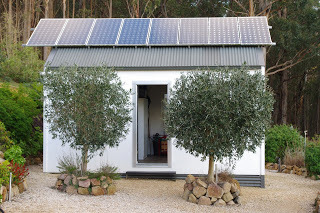 Yes, I used the plural to describe the systems because I have two off grid photovoltaic power systems here. 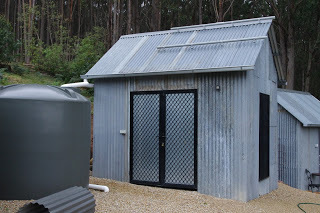 The first and very large 24V system is used for the house, whilst the second and much smaller 12V solar power system is used to power the several water pumps for the many garden taps and sprinklers used all about the farm, and the large uplit tree. For a long time I have had a small and quite old 80W solar panel which hasn’t been used. As many long term readers now know I am very tight, and not being able to use this 80W solar panel, whilst still having access to it, gnawed at my very soul! This week, I did something about getting that 80W solar panel into use. The first step towards using the 80W solar panel was the installation of racking on one of the panel free sheds. Roof space here is a premium commodity and if it is not collecting power and water, whilst keeping the rain of a person’s head, then all I can say is that that roof is not working hard enough! For those that are technically minded (everyone else who is not a techno geek can skip to the next paragraph!) 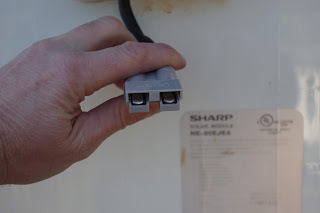 the standard plugs used in the world of all things solar powered are called MC4 plugs. They look hardy enough to the weather and there is no doubt that they work well. However, I have noticed that the metal components in the connectors don’t seem to have enough metal in order to transmit the very high currents often seen in off grid systems. 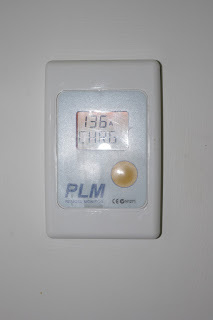 In fact I posed that very question to the renewable energy community down under and people have said that the plugs are rated to about 15 amps to 25 amps depending on the manufacturer which is perfectly fine for high voltage and low current grid tied solar power systems. However, in a low voltage and high current off grid system, I can regularly see currents in excess of 40 amps. With this in mind, I have begun using Anderson style DC connectors which are rated to 50 amps. 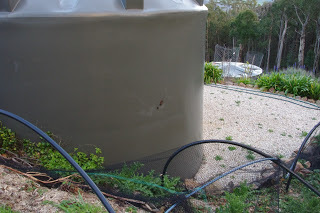 Once the racking was in place on the roof, I could then install the old and previously unused 80W solar panel and connect up the wiring. 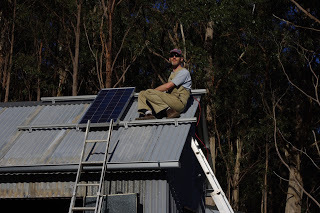 The editor positioned herself on the ladder at the front of the shed and did the very important job of stopping the solar panel from sliding off the roof before it was properly secured. Solar panels are actually quite heavy and awkward on a steep roof. It may surprise readers to know that those two panels together produce enough electricity to run two very serious high pressure water pumps when the sun is shining strongly! 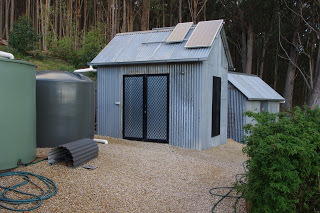 The much larger 200W solar panel in the photo above was relocated from the cantina shed and doing that that left a space for a new panel for the larger house system. I then added the final new solar panel to the house 24V photovoltaic system. That solar power system has a theoretical upper limit of approximately 50 panels (which is limited by the batteries). But that limit of 50 panels is not reasonable as it makes little, if any, economic sense. I will content myself with 4.8kW of panels and go no further. 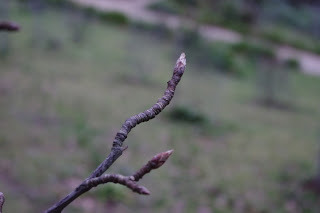 Spring has almost arrived here as I noticed the other day that two of the ornamental pear trees (Manchurian and Snow Pear) began producing buds which appear prior to budburst. The temperature outside now at about 9.15pm is 5.5’C (41.9’F). So far this year there has been 654.8mm (25.8 inches) which is up from last week’s total of 622.2mm (24.5 inches). There are many benefits to living high up on a mountain side in the forest. One benefit is that it is a quiet life, and I enjoy that. However, one thing that you can’t find up here in the forest is a cinema or a restaurant. That lack does seem to me to be a bit of an unforgiveable oversight on the part of the authorities and I suffer these indignities stoically! But if I do want to watch a film at the cinema or eat at a restaurant, I can travel into Melbourne by train. Travelling into Melbourne is a fun activity, as the country trains are very fast (130km/h or 81miles/h) and usually run every hour. The trains also manage the neat trick of dumping you into the middle of the city in less time than it would take for me to drive there. The train journey itself is really quite scenic. As the train speeds towards Melbourne, the mountain range recedes off into the distance. The train performs the other neat trick of deftly sticking to the high ground as the journey into Melbourne skirts around deep gorges cut by the local creeks and rivers during past geologic times. To the observer inside the train, farm land scoots past the windows in a blur and I get to sample the state of the seasons and country all from the comfort of the insides of the train. Sometimes, when the train reaches the outer suburbs, and the sun has been gently streaming in the window for a while, a feeling of lethargy falls over me and I cradle my head in my arms and lean against the window and have a short and refreshing disco nap! Hopefully during that important intermission, I don’t snore, and upon awakening, I am always careful to check my fellow passengers for signs of extreme annoyance directed towards me! Once the train journey has deposited me in the city, I can head towards my favourite haunts. Often this involves a walk of about an hour to get there. I could take the excellent trams, but I enjoy the long walk as I get to sample the state of the city and its people, all from the comfort of the sidewalk. On those long walks, I could travel anywhere within a 5km (3 mile) radius of the city, but instead I have chosen to limit myself to a small area of the inner city. To be fair, that area was chosen specifically because it has a huge array of food and entertainment options – even a cinema! If for example, my stomach was telling me to consume: chili dumplings; Xiao long bao; slow cooked pulled pork; or perhaps even an awesome hamburger, I’d know where to go. The downside of accepting the limitations of that small area of the inner city means that if a food or entertainment option isn’t available in that particular area, I accept that fact as that option is not available for me. This is not a problem because I then enjoy something else that is available in that location. For me this is no hardship. However, other people faced with that dilemma may suffer from a feeling of discomfit described as: the fear of missing out (FOMO). The fear of missing out is a real fear, which speaks to a person’s sense of having regrets or anxiety about making the wrong decision, whilst fearing that other people may be making better decisions. Worse, still is that the people who made the better decisions may be enjoying experiences and life more than yourself. And the only way that I’ve found to address that fear and anxiety is to accept limits. Accepting limits reduces my choices down to a more manageable number. The orchard this week has suffered from a number of daring night time raids. 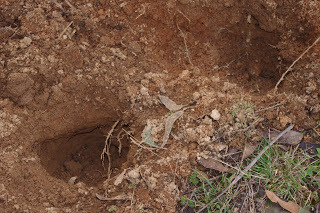 Something has been digging holes on the boundary that marks the edge of the forest and the lushness of the orchard. On Saturday, I had a good look at many of the holes and noticed that there were a number of very unhappy looking bull ants in most of the holes. I also noticed that at the bottom of the hole was a deep slender snout imprint. 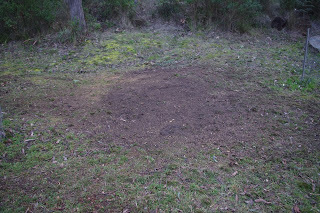 This can only mean that the culprit of this night time hole digging activity was none other than one (or more) of the Echidna’s that live here. 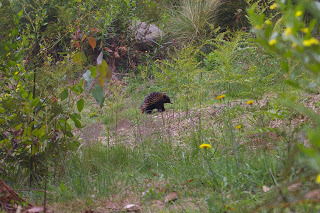 The Echidna was apparently digging up ants nests at night and then consuming the outraged ants who were silly enough to try and discover just what was happening to their otherwise quiet winter ants nest. The bull ants here are quite aggressive and will happily inject and spray formic acid on your skin causing unpleasant chemical burns which take a week or so to heal. With that in mind, I can’t honestly say that I am unhappy about the Echidna’s ant consuming activities! The bee colony appears to have over wintered well and they too are enjoying the slightly warmer conditions. There are plenty of flowers for the bees to harvest pollen and nectar from at this time of year too. 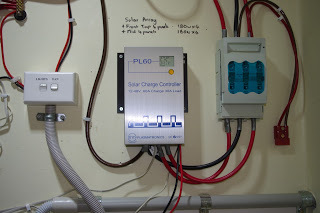 One of the four battery charge controllers for the solar power system has recently been having a minor intermittent problem. Fortunately the manufacturer is in Melbourne and so I’m hoping they will be able to repair that unit. Whilst that unit is off being repaired, this week I installed a spare battery charge controller in the system. Every now and then I get an urge to clean up the mess that the loggers left on the edge of the forest here. 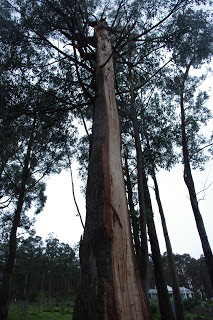 It is a big job as the loggers have been active in this area since about 1860. I believe at one point in time the loggers may have used a bull dozer and steel cables to pull the trees over and drag them to another area for processing. This processing usually meant that the tree stumps were left half buried in the ground, caked in clay, and also for some reason they are usually upside down so that the roots face the sky. 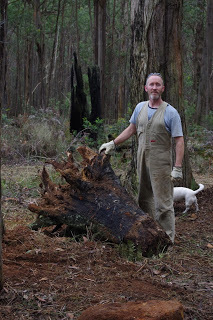 This week I pulled two of the old tree stumps out of the ground using hand tools and then burnt them off. The hard baked clay that was attached to the tree stumps was used to fill in nearby depressions in the ground. Observant readers will note the large steel wrecking bar used to lever the tree stumps free of the ground. 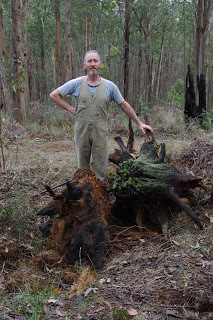 These tree stumps are really heavy as the timber for this species of Eucalyptus Obliqua has a density of around 650kg/m3 and they weigh far more than I do. I still had some energy left over and so I pulled an even larger tree stump out of the ground and then rolled it up hill and burnt it too. 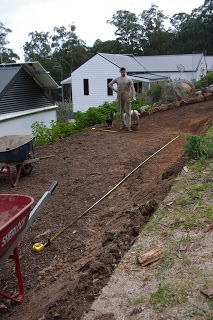 Then the next day, we commenced constructing a new terrace above the house. A terrace is merely the fancy name for flat land dug into the side of the otherwise sloping land. Construction of a terrace involves digging soil from the higher side of the “cut” and then depositing it on the lower side of the cut. Hopefully, in that process you have enough soil so as to produce flat land. Observant readers will note that the dogs are enjoying this new flat land! They may also notice how rich and chocolatey brown the soil was that was excavated.The soil ends up being quite stable as I plant many long lived and deep rooted plants into the sloping side and it seems to work. This is the beginning of new terraces above the house for new garden beds which will be individually constructed for specific plants.This first terrace, which is not yet complete, will be used for a fenced off thornless blackberry bed. Future terraces will also provide a site for two potato and one onion dedicated raised garden beds. The temperature outside now at about 9.15pm is 7.0’C (44.6’F). So far this year there has been 682.4mm (26.7 inches) which is up from last week’s total of 654.8mm (25.8 inches). This week the world has apparently gone mad for the Olympics, however this week’s blog title whilst appearing to be a nod to all things track and field, is actually a mash up of the words “Winter” and “Spring”. Down here at Fernglade Farm we’re in the in-between time where it is no longer Winter, but it is not quite Spring either. Thus the completely made up (portmanteau) name “Sprinter”! 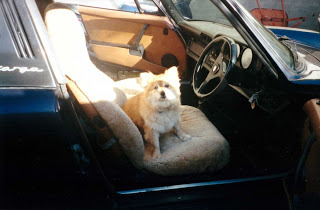 Over the past few weeks I’ve been writing about limits, and as winter is coming to an end and another growing season begins here, for some inexplicable reason I began thinking about “Fluffy the Pomeranian” who was the previous boss dog here. 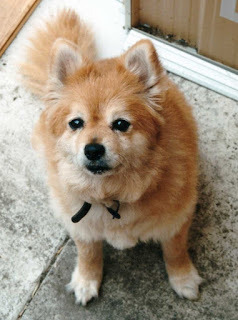 So, I thought that I would introduce Fluffy the Pomeranian to you – the reader – and tell you something about her story. Say hello to Fluffy the Pomeranian. 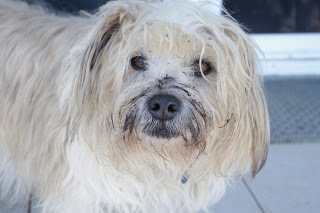 The start of the Fluffy story means going way, way back to the Lost Dogs Home in Melbourne. Sadly for us, Denver, the Jack Russell terrier had just passed away. Denver had been so named because he was rescued from a country road in the middle of nowhere. On that country road, Denver had been so malnourished that he was eating carrion from the middle of the road. Unfortunately for him he was so weakened by his recent experiences that he was unwilling to give up on his carrion meal merely to avoid being hit by the occasional passing vehicle on that lonely country road. The editor took pity on Denver and brought him back to live with us. He was a good dog. A real gentleman and very relaxed. At that time, the boss dog was a breed described as a Dorgi, which is a cross between a Corgi and a Dachshund. That boss dogs name was “the Fat” and whilst she was an excellent – if not mildly grumpy – boss dog, she had a few troubles with the concept of sharing food and we had to supervise food time for Denver otherwise his problems with malnutrition would definitely have continued. Don’t feel sorry for Denver though, as he lived for many more years in comfort before eventually passing away. With Denver’s passing a canine vacancy was available to be filled in the household. The Fat was visibly distressed by his passing, but I suspect she also rather enjoyed the new found freedom with the possibility of no competition at all for the sharing of the food bowl. So off to the Lost Dogs Home the editor and I went in order to find a replacement dog for Denver. We are not particularly fussy about dog breeds or even the age of a dog, but on this occasion, the editor chose a small white Maltese terrier and as we were in the process of making that choice, there was this rather strange looking dog bouncing up and down whilst standing on its back two legs pawing at the air in a begging sort of a motion. That dog happened to be Fluffy the Pomeranian. Let’s call her Fluffy from here on end. Fluffy was performing a trick simply to get attention. After a short but rather heated discussion between the editor and I, we (edit – it was fully a Chris decision) decided against good common sense, to take Fluffy home. Little did I know at the time, but Fluffy did that trick all the time. Seriously, that dog pulled one over on us (edit – just Chris). The previous owners who had abandoned her at the Lost Dogs Home named her Princess Shu Shu or some such stupid name. That dog had no boundaries whatsoever and to this day, I have never experienced a more poorly behaved dog. Not only was she exceptionally good at barking all night long, she also considered that the insides of the house – anywhere at all – was for all intents and purposes, her own personal toilet. Cushions were destroyed in the work of but moments. Clothes which were drying on the washing horses were dragged off and attacked without any provocation. I’ve since read that the Pomeranian dog breed is often highly intelligent, but exceptionally stubborn and wilful, and Fluffy encapsulated the very worst of the breed’s traits. No one seriously wants to deal with a stubborn and wilful dog. After two days of Fluffy’s many hijinks and escapades, I wanted to take her back to the Lost Dogs Home. She was a real bad egg that dog. Unfortunately for me the editor knew more about dogs than I and she refused to take Fluffy back, despite the fact that Fluffy had pulled out her stitches from a very recent operation despite her having a collar around her neck to stop that very thing happening. That dog was made of such tough stuff that even though the stitches were gone, and who knows where, the wound was opened, she healed perfectly and without infection. So over the next year or so, Fluffy, the Fat, the editor and I all played a game of cat and mouse to see who would break first. That experience has left me with a real appreciation for the skills of the horse breaker. Then one day, whilst I was cooking in the kitchen, Fluffy entered the kitchen and gave me what can only be interpreted as stink eye, and then she proceeded to urinate in the kitchen in front of me just in case she thought I was too stupid to understand what stink eye meant. It was rather unfortunate for Fluffy because she clearly had a full bladder on that day and so she dawdled overly long at her task of urinating on the kitchen floor. On that occasion I was quicker than her and I managed to grab her back legs as she rapidly attempted to decamp from the kitchen. Fluffy rapidly found herself upside down dangling by her back legs. And to my utter surprise Fluffy whimpered. It was the very first time that the dog had shown any remorse or concern for her appalling behaviour. (Edit – it might also also be worth mentioning the day that Fluffy vomited up cat poo next to the bath whilst I was taking a relaxing soak). From that point onwards Fluffy came to the sensible decision that life would be easier if she observed a few basic rules such as not barking all night long and not using the insides of the house as a toilet. The boss dog at that time was the Fat and she took Fluffy under her wing and they became good mates. As time went on, the Fat eventually grew old and died and I remarked to the editor that Fluffy wouldn’t care less about the Fats death. I was completely wrong because Fluffy lost most of the colour in her coat in the days following the Fats death. Fluffy then took on the role of being boss dog as seriously as she had taken on the role of being a complete pain. Bad behaviour became a thing of the past and rules for the other dogs and cat were enforced with a strong iron canine paw. Toothy, the long haired dachshund who many readers are familiar with, replaced the Fat, and Fluffy immediately took that very young dog under her wing. Fluffy used her tongue to spend at least half an hour of every single day grooming Toothy, and he loved every minute of it and would do whatever Fluffy wanted. But for me, Fluffy became a familiar. She shadowed me whenever she had the opportunity. We were good mates after our initial disagreements and understood each other and asked no more of each other than mere companionship. Everywhere I travelled she wanted to go. Fluffy had no fear at all and would react to strange dogs by trying to bite their eyes or attack their throats until they acknowledged her as the alpha animal – which they always did despite any size or attitude differences. Strangers used to stop me in the street and ask to take photos of her, and she usually obliged them by posing for their cameras. 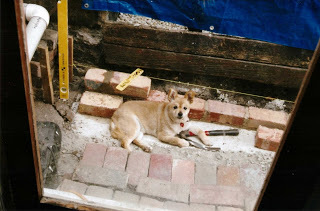 Whenever I was working on repairing a house, Fluffy used to sit nearby and keep me company and whenever I moved to a new location she would follow me and just sit contentedly. And she did so for many years. Alas, all good things come to end. By the age of sixteen, Fluffy had developed a wasting disease and began having painful seizures which left her screaming. Right to her final day, which I spent with her, she was a pleasant and faithful companion. But by late afternoon of that final day, I accompanied her to the Veterinary clinic where she passed away in my arms. I buried her deep underneath a lemon tree (the Fat is under another nearby fruit tree) and to this day the spirit of the Fluffy keeps on giving and she is not forgotten. 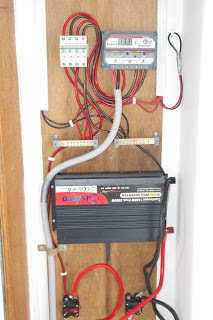 In farm news, earlier this week I undertook an upgrade of the wiring in the battery room that is the heart of the off grid solar power electrical system. That rewiring was more of an upgrade as I added new and larger feeder cables between the battery charge controllers and the batteries themselves. Larger sized cables reduce the amount of electrical friction in those cables so less electrical energy is lost to heat. I was immediately rewarded with the highest electrical reading from the solar panels that I have ever seen for the system. There had long been a huge tree stump in the middle of the lower paddock. The stump must have sat in that spot unchanged for at least three decades. It must have been a massive tree in its time and I had previously tried to burn out the stump. After six consecutive and very large fires set over the tree stump, I’d given up on that idea because it is a massive waste of firewood and whilst the tree stump was getting smaller, it was nowhere near disappearing. After all of those fires, the tree stump was still peering out of the ground at me, although in a now blackened charcoal state. 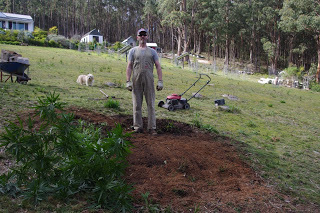 Over the weekend, I decided to test a petrol powered stump grinder on the tree stump and I was very impressed with the results. 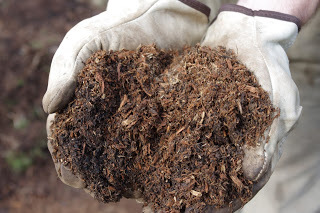 The stump grinder works like a hammer mill as it has very strong steel teeth which mulch up the timber and that produces a sort of fine shredded mulch which will quickly turn into quality soil. 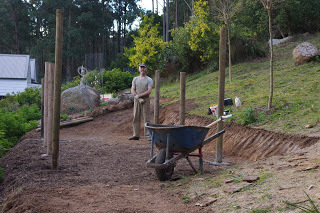 The new garden terrace which is being excavated by hand, doubled in size over the past few days. We have also added a layer of composted woody mulch over the excavated clay in order to hold the soil together in case a big rain fall event occurs. Oh, bone wars has continued amongst our canine collective and Scritchy the boss dog has thrown down the challenge to all contenders! Scritchy strikes back! 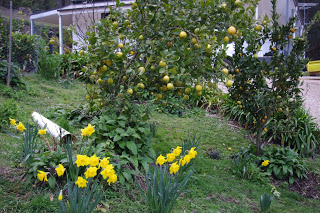 The daffodils have produced their first blooms this week and there are now brightly coloured spots of yellow in the still deciduous orchard. 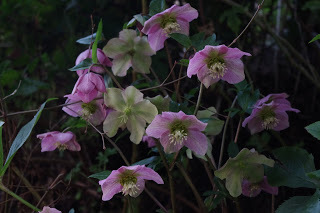 The hellebores are the late winter show off flowers and I spotted this dense collection of show offs this week. 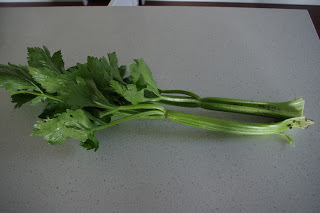 The mutant and very large celery plant – which I have had no hand at all in gardening because it was a volunteer plant – is producing very strongly still. I will definitely collect seeds from that mutant plant. 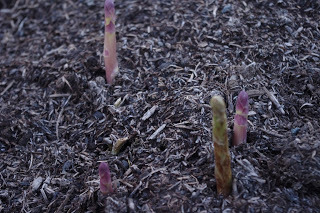 The older asparagus crowns are starting to producing spears this week. 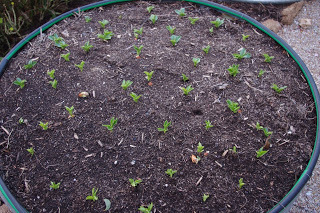 We planted the broad bean seeds very late this year, by about two months, mind you so it is nice to see them sprouting this week. 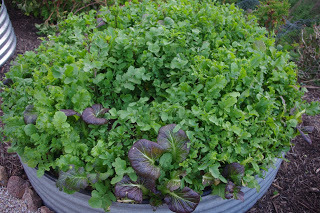 The salad greens are going from strength to strength and we have more of them than we can possibly eat. Fortunately for us, I caught a wallaby consuming them last night and shood it away before it could eat too much. Unfortunately though there are now less of them! The temperature outside now at about 8.30pm is 6.5’C (43.7’F). So far this year there has been 698.2mm (27.5 inches) which is up from last week’s total of 682.4mm (26.7 inches). The batteries are now 100% full at some point during each and every day! 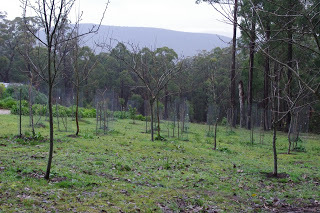 I have to admit that the outside weather conditions that night were very sub fluffy optimal and I was reluctant to head outdoors to see what possible antics the wombats were now up to in the orchard. On a not unrelated side story, a fierce wombat had been the feature of a news story only a few days ago because a lady in Canberra was mauled by a particularly ferocious wombat: ‘I really thought I was going to lay there and die’: Wombat mauls woman walking dogs in Canberra. Hmmm, those two rather large dogs in the photo in the article could probably benefit with a bit of Fernglade Farm fluffy canine / marsupial interaction training. And the first rule of fluffy when it comes to wombats is: Don’t annoy the wombats (edit – or do so from a respectable distance). That night though, I was however completely unprepared for what I saw outside hovering over the valley in the darkness. And no, it wasn’t the mothership which was about to disgorge its payload of rampaging aliens who would obliterate all before them. And no, it also wasn’t one of the local marsupial creatures performing a particularly dexterous martial arts move – worthy of Bruce Lee himself – on one of the fruit trees in the orchard. No, it was none of those things, although they would make for a good story wouldn’t they? Although the story would possibly be a bit truncated if it were indeed the marauding aliens. This is serious! 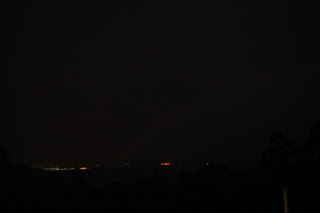 It really was a very rare sighting of a moonbow hanging over the Barringo valley. For those that aren’t technically inclined in all things weather related, a moonbow is simply a lunar rainbow, or a night time rainbow. A rainbow occurs when the sunlight during the day refracts light upon the droplets in rainfall. A moonbow on the other hand occurs when sun light reflected off the surface of the moon at night refracts light upon the droplets in rainfall. I never even believed such a thing existed, but apparently moonbows have been mentioned at least since Aristotle’s Meteorology (circa 350 BC), so they are rare events, but at the same time, they’re old hat, but also way cool! 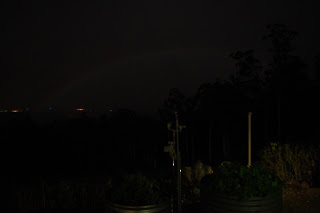 A closer photo shows the arc of the moonbow rising up out of the Barringo valley. Who knows why, but for some strange reason this week, my mind has drifted into the distant past and I have been contemplating the old 1970’s television show Kung Fu. That show had some great quotes and the Internet is quite useful in this regard as it provides a list of many of those quotes. In one episode Master Kan advised the much younger Caine (played by the now deceased actor David Carradine) that: “To suppress a truth is to give it force beyond endurance.” That is sage advice! If I was to slip into the mindset of that particular 1970’s television show for just a short moment, I’d say something obscure such as: “The way of the fluffy is a temple, whilst the dark forces of product crapification are arrayed against one, but be like the sun, grasshopper, and what is within you will warm the earth.” I have to confess to you the reader, that the dark forces of product crapification are pretty strong as I have discovered to my detriment this week. Product crapification refers to the increasingly shoddy products that we are sold. Every now and then I get stung by this dark and unrelenting force. Long term readers will recall that I have a nose for a bargain and am happy to follow my nose to where it may lead. And a few years ago I purchased a well priced leather couch. I like the leather couch, the editor likes the leather couch and the dogs like the leather couch. Its comfy. 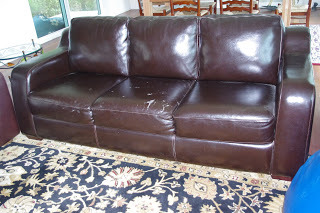 The problem is that, over the past year or so, that leather couch has started to crack, and chunks of leather have begun falling off the seats. I had never owned any leather furniture previously and was totally unaware that this cracking of the leather was even a remote possibility. I initially started to wonder whether I had actually purchased a vinyl (i.e. plastic) couch, but after some enquiries with re-upholsterers I discovered the awful truth. The leather coating on the couch is actually a manufactured leather made up from scraps of leather off-cuts which are glued to a synthetic backing and then cleverly joined so as to appear as if it were a single animal hide. Who knew that this manufacturing technique was even possible? Talk about product crapification, and you don’t need to be Einstein to know that the entire leather couch covering will eventually crack and fail. And I am now forced to consider the ethics of having this couch re-upholstered versus the economic realities of replacing it with another couch which is made from a proper leather hide. To add insult to injury, I recently had a very good idea which was subject to product crapification. Long term readers will recall that the editor and I brew all of our own alcoholic beverages. We brew enough home brew to provide an equivalent of one glass each for four nights of every week. The interesting thing that we have learned from this home brew experience is that in order to age all of that home brew for a minimum of one year, we have to brew and store a phenomenal quantity of home brew. There really is a lot of home brew product either fermenting or ageing around the house. The problem is that when visitors turn up at the house, they do not appreciate the sheer quantity of home brew that has to be fermented and stored to achieve that level of supply. And because people are people, their minds leap instantly to the wrong impression which they are only too happy to share with us. So recently I came up with the genius idea of storing all of the fermenting home brew product in a cupboard out of sight of the general populace. The problem simply disappears! To that end, I managed to scrounge a very nice looking second hand solid timber cupboard which can be left open to let the heat in so as to speed along the fermentation process, but also closed when visitors arrive. 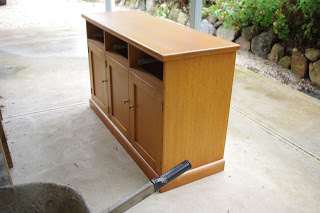 It was a totally genius idea, except that once we began sanding the solid timber cupboard we discovered that product crapification had struck again and the side panels for some strange reason in that otherwise solid timber cupboard were made from a timber veneer. A timber veneer is a very thin layer of high quality timber glued to a more substantial inner layer of totally rubbish el-cheapo timber. The timber veneer had been carefully matched to all of the other solid timber components too, so that ruse was very hard to spot. I never would have thought to check for that in only the side panels and nothing else. At least if there are problems with sanding the sides of the unit, I will be able to replace the two sides with solid hardwood. It is very hard to tell what products are subject to product crapification and what aren’t. 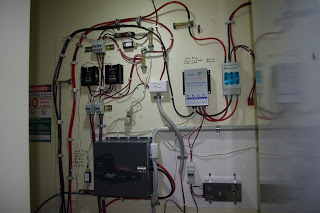 The majority of the electrical components that control the off grid solar power system are locally made. I recently acquired a new spare battery charge controller because one of the existing battery charge controllers was having a few very minor issues but which could be repaired. Upon connecting up the new spare battery charge controller, I discovered to my absolute and total horror that it was even more faulty than my existing battery charge controller. I couldn’t believe it! However, the manufacturer of the battery charge controller is located in Melbourne, so I contacted them and dropped the spare controller off for repairs at their business. After two days and some minor repairs, they returned the spare controller to me and it now works as good as new (which it was meant to be anyway)! 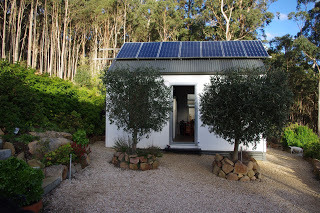 In other solar power news, a lovely guest on Sunday undertook the work of re-wiring the second and much smaller shed solar powered off grid system which provides power for several garden lights and water pumps. 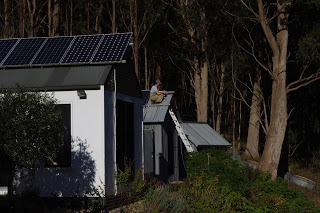 The smaller off grid solar power system had been getting more complex over the years and rewiring was an act of anti-product crapification which may help to balance out the many unjust blows that I have been dealt with over the past week. The way of the fluffy is still strong! 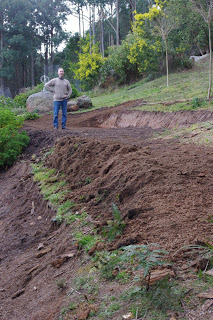 In between the many extended bouts of rain the editor and I have continued excavating the new terrace which will provide a place for the soon to be constructed and planted blackberry and strawberry enclosures. We have also continued taking out many of the very old tree stumps which are dotted all about the farm. 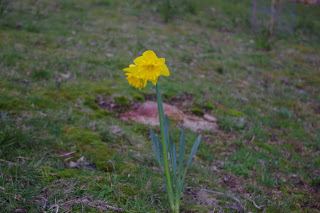 The daffodil flowers have continued to bloom this week and I have observed that the older the bulbs are, the earlier they will bloom. But the daffodil flowers are not a moonbow are they? The temperature outside now at about 8.15pm is 5.7’C (42.3’F). So far this year there has been 731.2mm (28.8 inches) which is up from last week’s total of 698.2mm (27.5 inches). Hubris is defined in my 1952 fourth edition copy of the “The Concise Oxford Dictionary” as: “Insolent pride or insecurity”. This week an unexpected turn of events forced me to reassess my own sense of insolent pride. 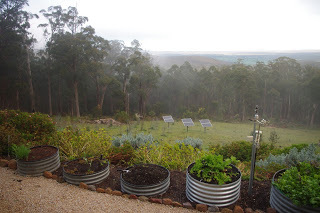 The story of the ghosts of irrigation past – and thus my fall from grace – commenced quite a few years ago at a local open garden. Have I mentioned before that I love local open gardens? An open garden is where a person that owns a garden opens it for the general public to peruse. From my perspective local open gardens are a great opportunity to observe how other people address many of the same problems that I also encounter. That use of observation, I believe, saves me from repeating other peoples mistakes. At one open garden in the now distant past, the editor and I by sheer chance met a local lady who we knew. After the usual amount of good natured chat was exchanged, the lady offered to introduce us to the gardener of that particular garden. It was a reasonably impressive garden and the editor and I took up the offer and plied the gardener with many questions, which the gardener was more than happy to answer. It was a very pleasant chat all round. One subject that I discussed with the gardener was that of the water pipe (or irrigation) systems in the garden. 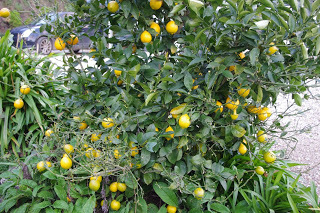 The gardener was very factual about the deficiencies of those water systems and also that the systems required constant maintenance and repair. It is a repeated discussion that I have had with many other people in similar situations and most of those people also recount a tale of woe and water systems failure. Unfortunately, my run of perfect hubris crashed and burned this week, because the water system sprung a leak and before 24 hours had passed, 1,500L (about 400 gallons) of stored water simply disappeared. And that was about the time I realised that with so much of the 100m (330ft) of water pipes buried, I had absolutely no idea where the water leak was in the system. Long term readers may also realise that the winter here has been very wet and damp and so the water leak was not even visible at the soil surface despite so much water leaking at one spot. The thing that really added insult to injury was that if I had constructed the water system on the cheap using cheap pipes and cheap fittings, then I would have felt better about the situation. However, I utilised very high quality components and installed them correctly. 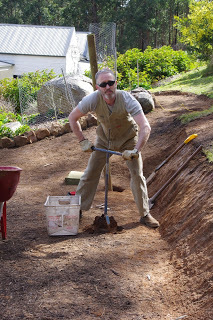 Speaking of being busy, the excavations for the new garden terrace continued this week. 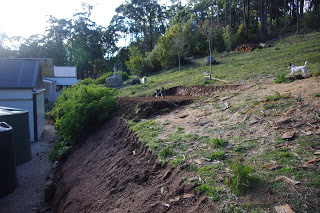 This new garden terrace which is being dug into the side of the hill – by hand – will be planted out with thornless blackberry and strawberry plants over the next few weeks. Both of those types of berry plants will be enclosed by their own purpose built enclosures. The now long dead ancient Greek mathematician dude: Pythagoras, came up with a theorem which the editor used (refer to above photo) to ensure that the new enclosure for the thornless blackberry plants ended up with reasonably accurate right angles. That mathematical wonder theorem was used by the editor to set out the boundaries for the berry enclosures. And this is a fortunate thing for me as digging holes with the hand augur tool was hard enough work. You could say that that most excellent theorem augured hard work for myself! Observant readers would have noticed a few things about the above photo. The cement was mixed by hand in the blue wheelbarrow with a shovel. Also, all of the treated pine posts are pre-loved as they were recent rescues from the local tip shop and the former chicken enclosure/current wood shed number 2 project. 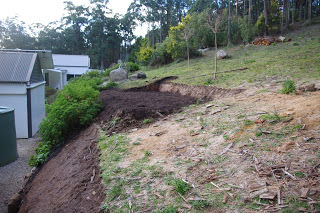 Plus a path which leads from a concrete staircase and down onto the garden terrace has also been dug into the ground behind me in the above photo. Lastly, you will notice that the two posts closest to the camera are much taller than the other posts which are further away (more on this at a later date). It has been a week of hard work. 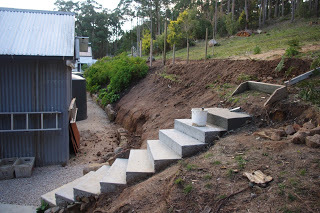 But never fear, just when you the reader were getting tired reading about all of this hard work, we also constructed another concrete step leading up to the new garden terrace. Actually, I reckon I’m feeling a bit tired reading about all of this hard work and probably deserve a nice glass of ginger wine! Speaking of which, the new cabinet which was purchased to store all of the fermenting home brew, out of sight of visitors, received a day or so of sanding in order to remove the varnish. 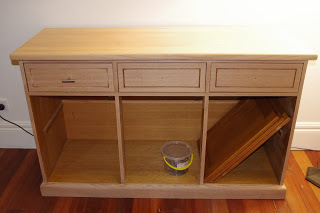 In the photo below you can see the original colour of the cabinet prior to sanding with the three doors which are much darker and are currently stored within the unit itself. The coming week here at the farm looks set to be another wet week. It has been a very wet winter here, which followed on from a reasonably hot summer. The humidity most days this week has reached 99% and on some days you can see the moisture in the air. 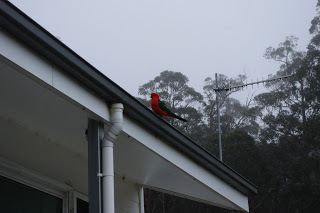 One of the most attractive birds to call the farm home is the King Parrot. It is good to be the King! And of course, being the King, must make it the most attractive bird here don’t you think? 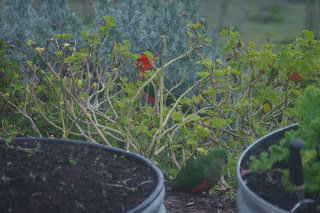 This week was particularly special because the King Parrot decided to show off its new progeny. I was surprised at what a little chunkster the baby King Parrot was! It has certainly grown up in a good paddock! 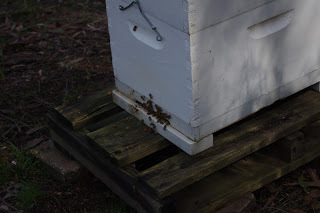 The remaining bee hive appears to have over wintered well and the bee foragers are now flying all over the place whenever the sun shines in between the grey late winter skies. 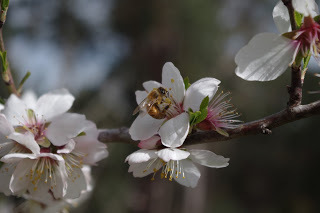 I caught this bee harvesting some pollen from the very early flowering almond trees. Observant readers will be able to see collected pollen as a yellow lump on the furry gut of the bee. 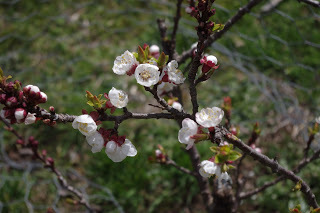 The earlier varieties of apricot have begun to produce blossoms this week too! Yay for Spring! The antics of the local marsupials whom inhabit the orchard at night never cease to amaze me. A wallaby however has upped the ante and achieved a feat that few wallabies have the skill to achieve. Yes, dare to dream my marsupial friends as the bar has been set very high with this particular feat. The temperature outside now at about 9.00pm is 8.6’C (47.5’F). So far this year there has been 748.0mm (29.4 inches) which is up from last week’s total of 731.2mm (28.8 inches).